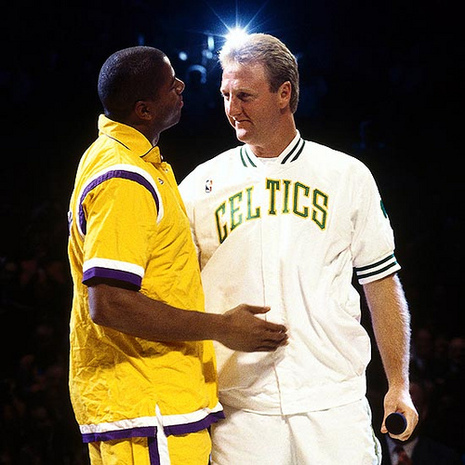 Feb. 4, 1993 In an unprecendented move, the Celtics hold Larry Bird Night at the Garden—with no game scheduled—to celebrate Bird's career and retire his number. Scalpers would get as much as $400 for coveted tickets. The 2 1/2-hour event is emceed by Bob Costas and features video highlights and personal testimony from former teammates and past Celtics greats. 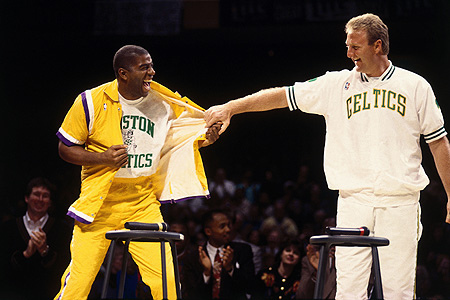 Magic Johnson also makes an appearance, revealing a Celtics T-shirt underneath his Lakers warmups. On a cold Thursday night in February 1993, the Boston Celtics raised No. 33 to the rafters of the Boston Garden, as the team retired Larry Bird's number. Drafted by Boston out of Indiana State in 1979, Larry Bird played his entire 13-year pro career for the Celtics. He won the NBA Rookie of the Year Award in 1980 and was the league's Most Valuable Player three seasons in a row, matching a record held only by the legendary Bill Russell and Walt Chamberlain. Auerbach guided the team to an unprecedented nine NBA championships, including a record eight straight from 1959-1966. The Celtics have won the championships 16 times, more than any other team. Auerbach retired in 1966, and Bill Russell assumed the role of player-coach. The Celtics won two more World Championships during his three years in the job, but the aura of invincibility was beginning to fade. The Philadelphia 76er's emerged as the new powerhouse in the Eastern Division. The 1991-1992 season was his last as a player. After working for several years in the Celtics front office, he became head coach of the Indiana Pacers. He led them to the 2000 NBA finals, where they lost to the Celtics' old rivals, the Los Angeles Lakers.